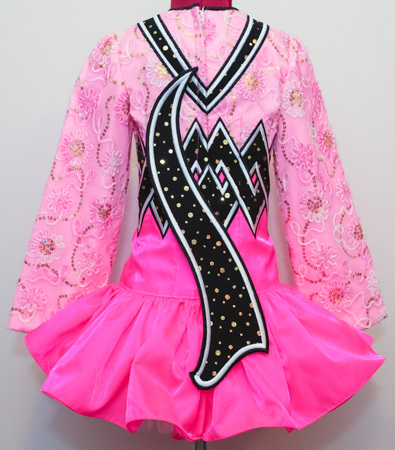 Hot pink twinkle satin bodice with baby pink floral bodice yoke and sleeves with sequin embellishments, with bold black and gold sequin zig-zag applique across chest. 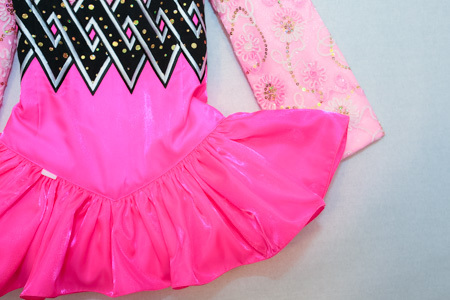 Modern extra dropped waist skater skirt constructed from matching pink twinkle satin. Petite modern style asymmetrical black and gold shawl. Baby pink and white polka dot underskirt lining.